Angelo Valenton is the Founder and CEO of Power 4 All, Inc a technology provider and project management of Off-grid Solutions for power and clean water. He is also currently the Chief Executive Officer of Connect Group Inc, a management consulting and services team as well as president of Best Brand Inc., a consumer electronics distribution company. 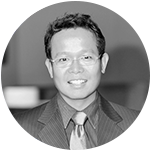 Prior to these roles, he served as the General Manager of Philips Consumer Electronic Philippines and Director of Philips Electronics & Lighting, Inc, Country Manager of Philips Consumer Communications Philippines, General Manager of Philips Domestic Appliances & Personal Care Philippines, Product Marketing Manager of Philips Consumer Electronics- New Business Group and Audio Business Group. He also served as the Group Product Manager of Universal Food Corporation, Philippines and Senior Brand Assistant, Dairy Products Division of Universal Robina Corporation. He graduated at De La Salle University with a degree in Commerce Majoring in Marketing Management and holds a Master in Business Administration, Regis Senior Executive Program from the Ateneo Graduate School of Business.